There’s a gust of Bonaire blowing into the Southern Islands today with the launch of AMD’s HD 7790. 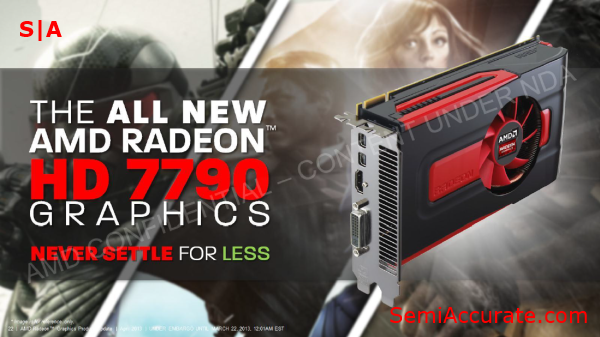 At its core the HD 7790 is a midrange GPU designed to fill the gap in AMD’s lineup between the HD 7770 GHz Edition and the HD 7850. With a die measuring 160mm2 the HD 7790 fits in right between the HD 7770’s 123mm2 die and the HD 7850’s 212mm2 die. Even when we look at the $150 price tag of the HD 7790, it manages to split the gap between the $100 HD 7770 and the $200 HD 7850. In almost every way the HD 7790 is the middle ground inside of AMD’s midrange graphic card lineup. It’s also a card that is aimed squarely at displacing the current king of the $150 price point, Nvidia’s GTX 650 Ti. This is a role that, at least according to AMD’s own benchmarks, the HD 7790 proves to be well suited for. Alas we don’t have resources to do a proper third-party comparison at the moment, but hopefully we’ll be able to rectify that oversight in the future. For now though, an overview of the major changes encompassed in the HD 7790 will have to suffice. 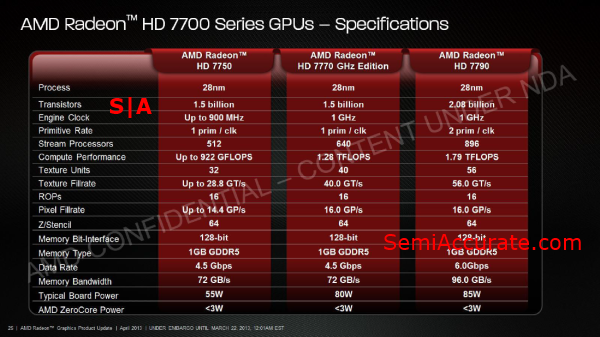 The HD 7790 is the first desktop incarnation of AMD’s 2nd generation Graphics Core Next (GCN) architecture. A quick look through AMD’s guide to the Sea Islands architecture reveals that surprisingly little has changed from the original GCN architecture that was introduced with the HD 7970. The memory management abilities of the architecture have been improved, but there seems to be very little in the way of changes that would immediately give a GCN 2.0 GPU an advantage over a vanilla GCN GPU in terms of raw gaming performance. If this sounds familiar, it is probably because we told you about this lack of excitement almost six months ago. 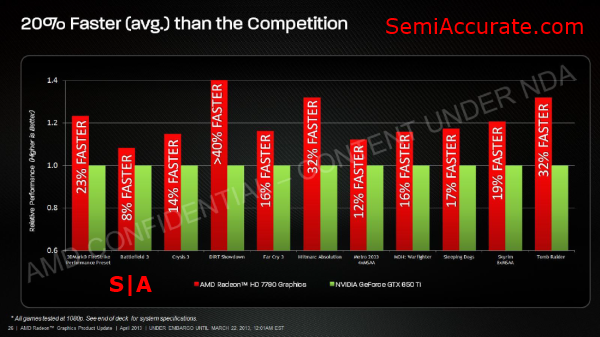 AMD has made notable improvements in two key areas though, load power consumption and power management. Despite outperforming the HD 7770 GHz Edition by significant margin, the HD 7790 has a TDP that is only five Watts higher. This adds up to a pretty significant improvement in performance per Watt over the HD 7770 GHz Edition. The real magic though is in the changes that AMD’s made to their PowerTune technology. With the HD 7790, PowerTune has become much more granular power management system. In previous PowerTune implementations there were four clock speeds and voltage (or DPM) states that a given GPU could run at. PowerTune would allow the GPU to switch between these clock states, while maintaining the top state’s voltage point, to keep the GPU within its TDP limits when it was under load. With the HD 7790 though, AMD has doubled the number of DPM states so that the GPU can maintain higher clock frequencies by switching between DPM states that are closer together. These additional DPM states also reduce power consumption by giving the GPU eight voltage states to choose from, rather than just four. 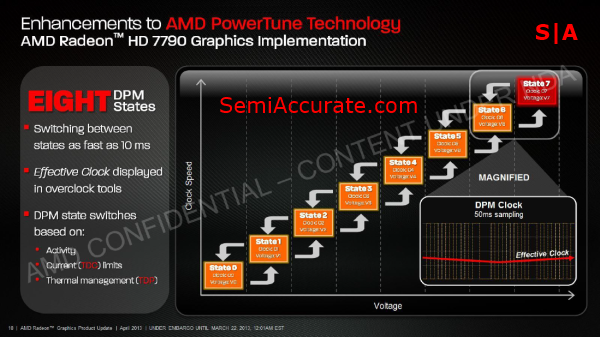 By reducing the gap between each of the power states AMD has drastically increased the efficiency of their PowerTune implementation on the HD 7790 compared to previous iterations of the same technology. 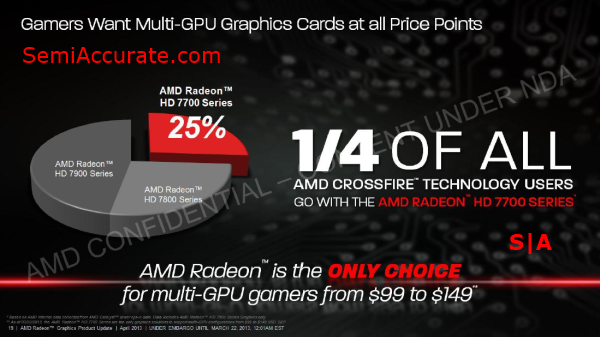 One of the more interesting, if a bit tangential, points in AMD’s presentation was their statistics on the GPUs that are being used in Crossfire configurations. It appears that despite the relatively low performance of the HD 7700 Series, they currently power a full quarter of the HD 7000 series systems that have Crossfire enabled.